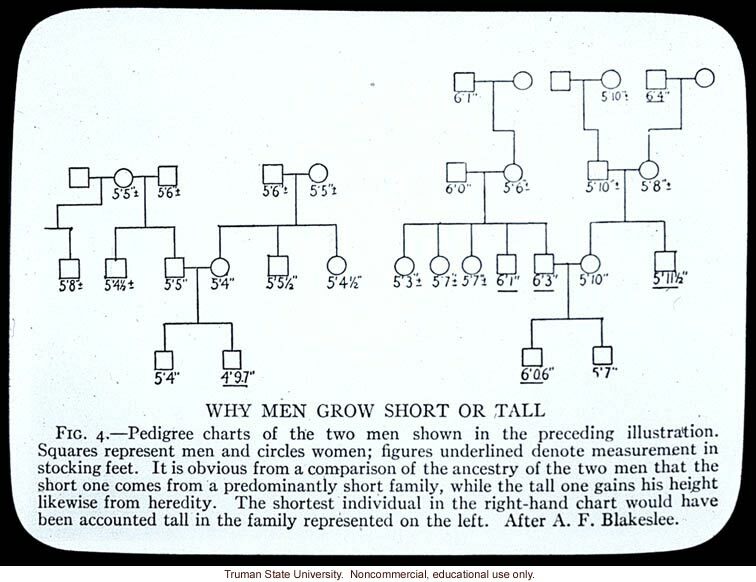 Eugenic Archives: Pedigree: "Why men grow short or tall"
Pedigree: "Why men grow short or tall"
View this image in our new website. Copyright 1999-2004: Cold Spring Harbor Laboratory; American Philosophical Society; Truman State University; Rockefeller Archive Center/Rockefeller University; University of Albany, State University of New York; National Park Service, Statue of Liberty National Monument; University College, London; International Center of Photography; Archiv zur Geschichte der Max-Planck-Gesellschaft, Berlin-Dahlem; and Special Collections, University of Tennessee, Knoxville. The images and text in this Archive are solely for educational and scholarly uses. The materials may be used in digital or print form in reports, research, and other projects that are not offered for sale. Materials in this archive may not be used in digital or print form by organizations or commercial concerns, except with express permission.